Looking for a way to showcase curios and merchandise while having a place for supplies? These display cases with storage are great for retail stores because users can showcase wares while hiding other materials out of side. 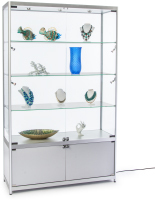 Each stand features (2) or (3) tempered glass shelves for extra visibility. Their clear doors are made of the same strong material, and they feature a locking mechanism for added security. 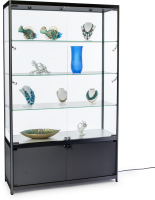 This makes the display cases with storage an ideal choice for retail stores and other public areas because users can keep valuable items in plain sight without the threat of theft or tampering. Both sets of doors can lock, keeping all contents secure from mishaps. What options are available with these rectangular glass showcases? 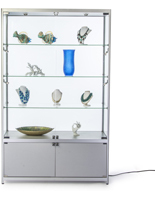 While most display cases with storage shown here feature top LED lighting, some stands also feature side illumination. This allows users to create more presentations and shadow effects with the additional fixtures. This track lighting is adjustable, making this extra feature an excellent choice. The number of lights may vary between models, this can be found in the "Specifications" of each page. 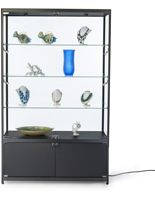 Display cases come in a choice of four finishes: black, maple, rosewood and silver. Customers can choose a cabinet that fits their décor, although each one is made to fit in a number of environments. Each cabinet is made of strong laminated particle board or laminated medium-density fiberboard. Some fixtures feature a mirrored back while others have a clear back, making them "full view" models. 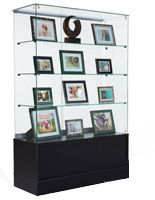 Display cases with a reflective backing, allow onlookers to see all sides of the showcase items. Models with a clear reverse side are great for placement in lobbies and hallways where passersby can walk around the fixture. Where can these tempered glass cases be used? Schools and universities can use them to feature trophies, awards and even students' projects. When placed in a hallway or front lobby, students and parents can see the establishment's achievements. As mentioned before, stores can make great use of these stands because they can prominently showcase wares like handbags, accessories, sports memorabilia, and jewelry. In the home, these cases can be used to show family heirlooms and other valued curios. Using these models, companies can display their merchandise and other projects in a front lobby for employees and visitors to see.